What is a New York Quit Claim Deed? New York Quit Claim Deed: What Is It? A quit claim deed in the state of New York is a document used to transfer ownership interest from one person. In contrast from a warranty deed, this document provides no guarantee that the title of the property is clear and free of encumbrances when being transferred. A quit claim deed only provides the buyer with a guarantee that the seller will not return at a later date and claim an interest on the property. It is highly recommended that the buyer conduct a thorough title search to ensure that the property is free of all issues. Signing - According to New York Law (RPP §306), all quit claim deeds must be signed by the Grantor with a Notary Public present. 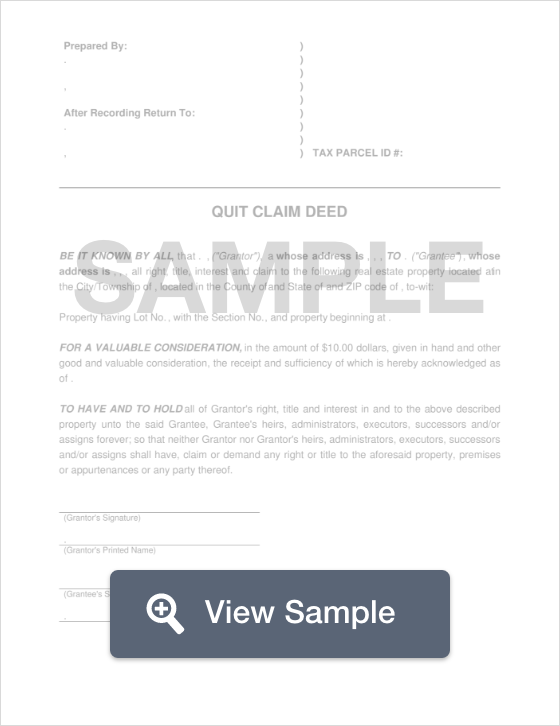 Recording - All quit claim deeds in the state of New York must be filed with the County Clerk’s Office in the city or county that the property is located.